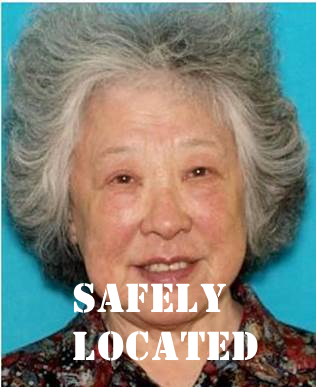 The Elk Grove Police Department is asking for the community’s help in locating an at-risk missing person, 85-year-old Nancy Chin (photo above). Nancy was last seen earlier this afternoon at her residence in the 9600 block of Red Current Way. Nancy is hard of hearing and speaks little English, primarily Chinese/Mandarin. Ms Chin is an Asian female adult, 5'4", 140 lbs. She was last seen wearing a dark blue or navy blue jacket. Anyone with information regarding the whereabouts of Melody Plath is asked to contact the Elk Grove Police Department Dispatch Center at (916) 691-5246. If you have seen Nancy Chin or know of her whereabouts, please call Elk Grove Police at 916-691-5246.